In this unflaggingly suspenseful story of aspirations and moral redemption, humble, orphaned Pip, a ward of his short-tempered older sister and her husband, Joe, is apprenticed to the dirty work of the forge but dares to dream of becoming a gentleman. And, indeed, it seems as though that dream is destined to come to pass — because one day, under sudden and enigmatic circumstances, he finds himself in possession of "great expectations." In telling Pip's story, Dickens traces a boy's path from a hardscrabble rural life to the teeming streets of 19th-century London, unfolding a gripping tale of crime and guilt, revenge and reward, and love and loss. Its compelling characters include Magwitch, the fearful and fearsome convict; Estella, whose beauty is excelled only by her haughtiness; and the embittered Miss Havisham, an eccentric jilted bride. 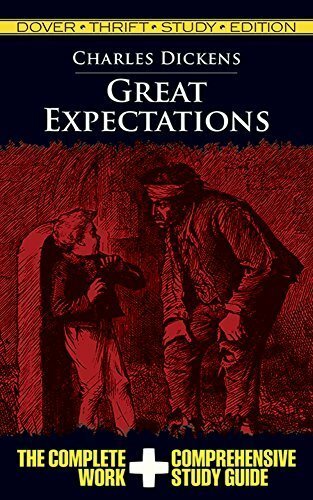 Written in the last decade of Dickens' life, Great Expectationswas praised widely and universally admired. It was his last great novel, and many critics believe it to be his finest. Readers and critics alike praised it for its masterful plot, which rises above the melodrama of some of his earlier works, and for its three-dimensional, psychologically realistic characters — characters much deeper and more interesting than the one-note caricatures of earlier novels. "In none of his other works," wrote the reviewer in the 1861 Atlantic, "does he evince a shrewder insight into real life, and a cheaper perception and knowledge of what is called the world." To Swinburne, the novel was unparalleled in all of English fiction, with defects "as nearly imperceptible as spots on the sun or shadows on a sunlit sea." Shaw found it Dickens' "most completely perfect book." Now this inexpensive edition invites modern readers to savor this timeless masterpiece, teeming with colorful characters, unexpected plot twists, and Dickens' vivid rendering of the vast tapestry of mid-Victorian England.